All photos by Jenny Bonchak, courtesy of Slingshot Coffee Co. In seems like everybody is cold-brewing and bottling or canning coffee these days. But if we go all the way back to 2012, among the modern cold movement’s trailblazers was Raleigh’s Slingshot Coffee Co., led by the married team of Jenny and Jonathan Bonchak, two experienced baristas with close ties to Counter Culture Coffee. 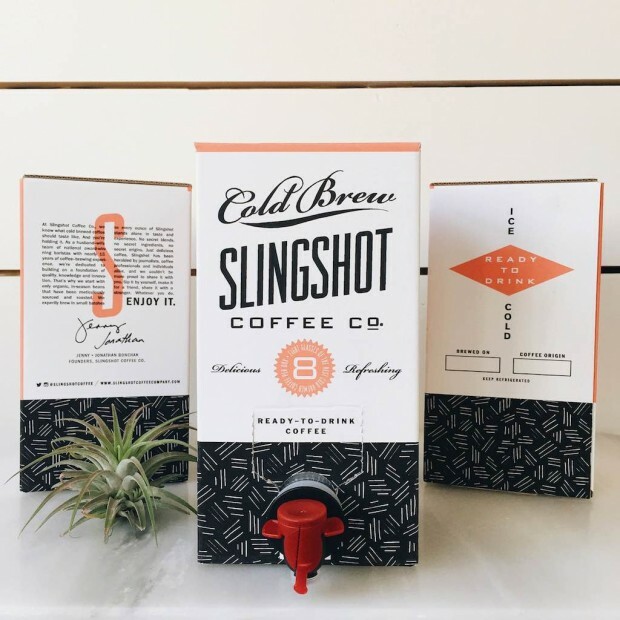 Slingshot has been furiously filling and capping since then, reaching store shelves throughout the country, securing capital investments, adding products including a cascara tea and generally holding its own among the heads of the cold-brewing pack. One of the company’s most interesting recent developments was the introduction of a boxed cold brew — a 64-ounce, eight-serving product designed to maintain cold brew freshness for repeated pours over time. The Slingshot team has been fleshing out the box concept since as far back as late 2014, and while the natural graininess of the cardboard surface required that some elements, such as the bar code, be printed bigger than might be required for labels on smooth glass bottles, the size of the box panels allowed the designers additional flexibility in branding. The back of the box includes large, simple instructions for how to use the box — including a plea to consumers to recycle — while one side shows hand-written “brewed on” dates and regions of origin, and another side includes a statement from the Bonchaks about the company and what it stands for. It’s a brand that prides itself on quality, innovation and experience, with its leadership well-seasoned within the coffee industry and barista competition circles. When we spoke with Bonchak, she was fresh off winning a trip to the 2016 U.S. Brewers Cup championship after earning the highest score among competitors from throughout the United States at the recent qualifying event in Kansas City. Asked why she’s still making time for the competition circuit while Slingshot’s growth has provided her plenty of work over the past four years, Bonchak spoke of innovation being part of Slingshot’s DNA since day one.